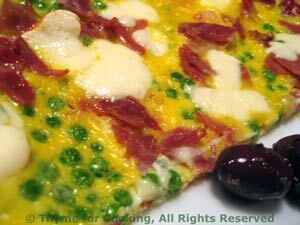 Frittata with Prosciutto and Peas, Thyme for Cooking easy first course. This is a favorite dish in Tuscany in the spring, with fresh peas. We use frozen. Use any soft cheese, like Fontina or Mozzarella. Thaw the peas well in hot water. Add peas and sauté until hot, about 2 minutes. Add the eggs and stir until the peas and Prosciutto are evenly distributed. Spoon the cheese on top. Cover and let cook just until the eggs are set and the cheese melted. Remove, cut in half or quarters, and serve.